The members walked out of the legislature Friday after complaining their homes had been looted by government security forces. The legislators say they will not return until proper security is established. Bemba is a former rebel leader and vice president who lost the presidential election to incumbent President Joseph Kabila last year. Bemba left Congo for Portugal this week for medical treatment. He spent the previous three weeks holed up in the South African Embassy in the capital, Kinshasa. Bemba took refuge there last month during clashes between his militia and government forces, which killed hundreds of people. The fighting broke out after Bemba's soldiers refused to return to regular army service, saying he could not be left without protection. 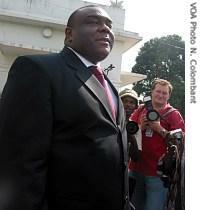 The DRC' s top prosecutor has asked the country's Senate to lift immunity for Bemba so he can be charged with treason.